"TARZAN IN SAVAGE PELLUCIDAR" COVER (1975) Media Type: Pencil and Ink Art Type: Cover Artist(s): Russ Manning (pencils & inks) Check out this incredible detailed TARZAN cover, which was penciled and inked by the great Russ Manning, from the story titled: Tarzan in Savage Pellucidar! This nice cover features Tarzan battling 2 tigers, with the help of an elephant! 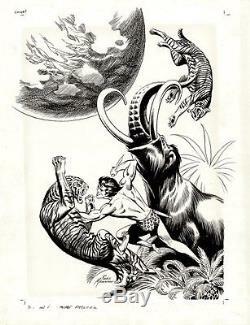 Tarzan in Savage Pellucidar was a forty-eight page graphic novel, written by Mike Royer and drawn by Russ Manning, that was published in numerous European countries. In this story, Tarzan enters Pellucidar in a submarine down through bottomless Loch Ness. There he fights Hooja the Sly One and the Sagoths as the Mahars try to regain their Great Secret. Just a great Russ Manning cover that should be seen to be appreciated. Cover has very slight sun fading from it being matted in the past. The mat has been taken off to show all of the beautiful artwork. Cover has an actual drawn image area measuring 12.75 by 16.75 inches, on a 14.25 by 18.5 inch art board! Compare this nice cover art to the published comic book HERE. Just send us a message and we can try to work something out. Please find out more about me and my other items here. The item "Manning, Russ TARZAN IN SAVAGE PELLUCIDAR COVER Large Original Art (1975)" is in sale since Thursday, July 24, 2014. This item is in the category "Collectibles\Comics\Original Comic Art\Covers". The seller is "romitaman" and is located in Ravenna, Ohio. This item can be shipped worldwide.